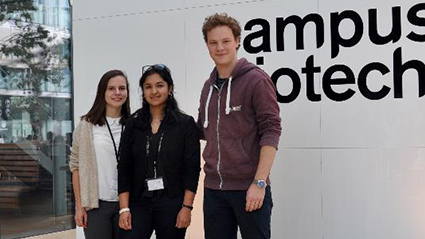 Vincienne Naef, Grace Kurian and Marc-Aurèle Adler are third and fourth year medical students at the University of Geneva. All three attended the Neurobiology of Mental Health conference, an ideal opportunity for Synapsy to meet up with the future generation of putative psychiatrists. It is hard to tell what the clinical researchers of tomorrow will be like. When it comes to mental health, Synapsy hopes that they will come from psychiatry and will have a strong background in fundamental neuroscience. But what do those directly concerned think? Synapsy got down to business by taking a look at the student’s respective interest in research, psychiatry and neuroscience. Neuroclub was partially responsible for pointing them in the right direction, as has been the case for many medical students of the University of Geneva (see our Newsletter No. 5, November 2016). When Vincienne started off in medicine, she had no interest in the three disciplines. But the wide array of events put on by Neuroclub –together with lectures and chance discoveries– began to draw her towards research and psychiatry. “As a means of making a financial contribution to my medical studies, I look after people suffering from autistic disorders. I also did a research internship on autism with Marie Schaer, and now I would like to find out more about it. Research is a complicated world that calls for so much investment that it’s a bit frightening at the moment,” says Vincienne. Grace was prompted to embark on a career in medicine by the public health aspect, even though she has always had an interest in neuroscience. Neuroclub helped Grace discover a facet of medicine that was unfamiliar to her research. “Various speakers talked about the links between research and medicine, especially the role of clinician-researchers.” Grace’s curiosity in research, neurology and psychiatry was heightened during an internship in an immunology research laboratory as well as by progressive learning courses (APPs) on neurological subjects. She also worked for three years in child guidance, where “a fascinating new world was opened up by being in close contact with child psychiatrists, speech therapists and psychologists.” Despite this, it is still hard for Grace to look too far into the future at the moment. Grace also believes that it is vital for doctors to appreciate what is happening in research and to have a solid base since : “They have to keep in touch with all the latest developments. The opposite would be reprehensible!” Knowing about molecular mechanisms is not crucial for doctors, suggests Marc-Aurèle : “Clinicians have to know whether their treatment is effective against a particular pathology or not. All the work trying to understand and validate the drugs must be done upstream. Clinicians can’t know everything because the different fields are so vast.” All three students acknowledge that they do not fully know whether an understanding of the most basic mechanisms is essential for treating patients properly. They do agree, however, that this knowledge helps their thinking and, by extension, their ability to carry out a diagnosis.